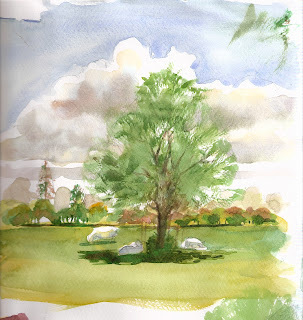 Last week I took my wednesday, and thursday Comberton watercolour classes out on location, firstly to Wimpole hall estate, and then to the view over Wimpole from a hill in Eversdon. 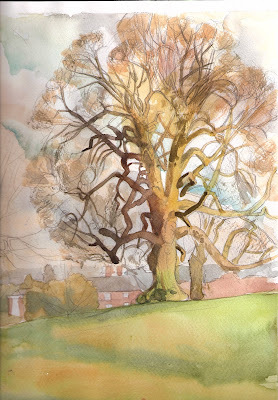 We focused mainly in the trees, and practised our dry brushstroke technique for the fine twigs and branches, and also, for the sparse spring foliage. Dry brushstroke is achieved by holding your paintbrush so it is almost horizontal to the papers surface, and using the whole width of the brush, tickle the the paper lightly, skimming the surface texture of the paper, and don't over do it or it will all fill in, also, if it is still filling in, it's likely that you either have too much water on your brush, or you are holding the brush at too steep an angle. To make the dry brushstroke look effective to represent the outer twigs of a tree, pull the length of the brush to the center of the tree from the outside edge, so it looks like it's radiating out from the main arterial branches. 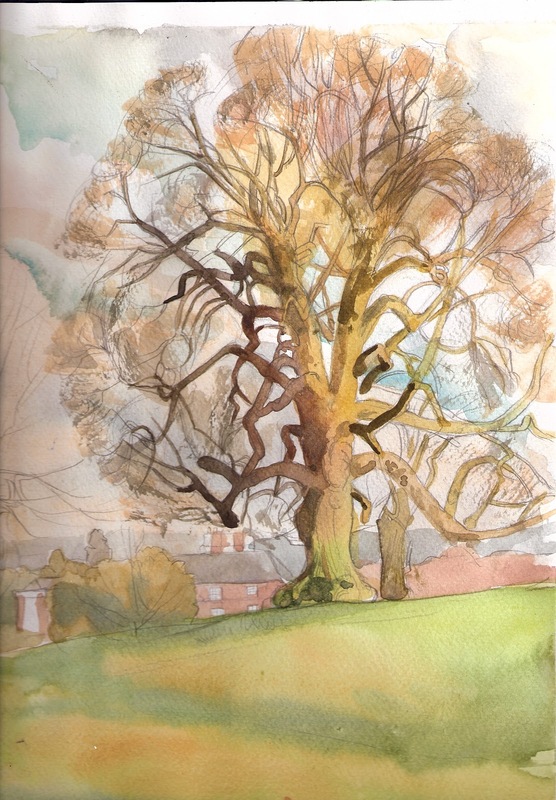 And paint the branches in last if the tree is in foliage, leaving gaps in the branches where they are obscured by the foliage, if you don't, it will look like the tree is in front of it's foliage. Painting outdoors can take as long as you like, from rough sketches to something more finished, this may depend on how comfortable you are, if you're not used to it, start by painting near your car or house, so you won't be stuck in the middle of nowhere freezing cold or having to lumber too much equipment around with you. I also find it's useful to take my camera with me everywhere, either to give myself the option of completing a painting back in my studio, or to store interesting scenes in my photo reference file. I could kick myself sometimes for not having a camera with me when an interesting scene captures my eye.